The bures at Aroha Taveuni Resort are only meters from the beach, so you can lie in bed at night and listen to the gentle lapping of the waves. We're able to watch the most beautiful sunsets, the local Taveuni children playing on the beach, local women fishing for the evening meal, and sometimes we’re lucky enough to see dolphins playing in the beautiful clear waters. Enjoy a leisurely breakfast, a wood-fired pizza, and a dinner serenaded by the sounds of the ocean at our newly opened Kai Time restaurant. 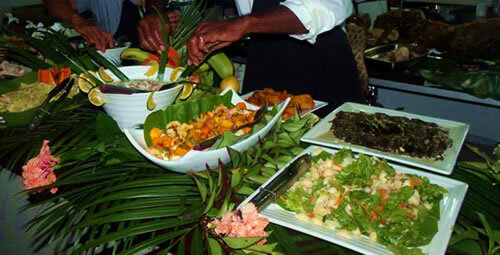 We use fresh local seafood and the best fresh produce from the many small farmers on Taveuni Island to cook sumptuous meals. After being owners and operators in the tourism and hospitality industry in New Zealand for many years we thought we would settle somewhere warm and picturesque. We found Taveuni. After living here for a time we decided that this beautiful ‘Garden Island’ is far too nice a place not to share. We built the type of resort that we choose to stay in when traveling the world: independent and with freedom to choose where to go, where to dine and what sites to see. Come experience Taveuni with us. Our guests leave us great reviews.